I had been at City Hall 2 years earlier on Christmas Eve eve when the Board of Alderman decided to shut down the largest provider of shelter to the homeless. Since that time the city has not taken any action to provide services for the over 300 people who became unhoused in that decision. I am pretty sure the situation in St Louis is not all that different from other cities where resources do not go towards providing the most basic of needs for the most vulnerable among us. An all volunteer team has increased their outreach especially in the extreme weather, exacerbated by climate change. Last winter 2 men froze to death seeking refuge from the severe cold, one in a port a potty and the other in a dumpster. Two men found frozen to death in St. Louis As the polar vortex spans across the country, more people in numerous cities are at great risk. The New York Times reports on the impact of the Polar Vortex on the homeless in the Midwest I imagine there will be more deaths that occur during this cold spell that is breaking records and hasn’t been seen in a generation. It seems to come back to misallocation of resources. Similar to the federal budget, city budgets are devoting more of our resources to increased militarization. 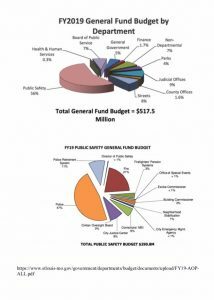 St. Louis city devotes 57% of the general budget to “public safety”which is largely to the police. While I am steadfast in my resistance to paying taxes to the military, I am also becoming more aware how other taxes I pay are contributing to increased militarization that is coming closer to home. It is not being directed towards services for basic human needs that I and many others want to see supported. I was recently looking at NWTRCC’s website about redirection as the bonus of War Tax Resistance. I am so grateful for this essential aspect of NWTRCC that is investing in the world in which we long to live! The desire to end suffering caused by war has been a large influence of WTR but even stronger has been the drive towards justice. We have such great power in our choices in our everyday actions. I returned to city hall today to call for accountability from the city concerning those whose basic need for housing has gone unmet. They allowed us to hold space an hour and ½ after closing time but they did not meet the request to open the space to those who needed it most and whose lives they may have saved. So I will continue tomorrow with phone calls, with sharing resources and trying to raise awareness. And more than anything I will commit myself to celebrating the actions of people who are oriented towards justice. It’s kind of ironic that all too frequently when I have talked about War Tax Resistance, people have heard me say “Vortex Resistance”. The perfect storm at city hall brought me in contact with some WTR and quite a few more who are interested. Did Chrissy write this? No author is listed, however kudos for the essay and the reminder to remember why we do this resistance. Thanks Matt! And yes I am the author. Yes. Every action or non action has consequences. Since 1964 have imagined that folks would connect the dots n we would have a renaissance of awakening. Still filled w.hope that this will happen in my lifetime♡ I have committed a lifetime to under-earning. Dedicate time to Human Rights for women and children! Environmental Social Justice n Human Rights for indigenous of the world. I had both my children at home. Now as grandmother hold hope for grand-awakening n redirection of earth’s resources and protection of all sentient life. Here’s few local to global projects dedicated to. #citiesforCEDAW.org http://www.suscolcouncil.org check them out. Join up or send donations…successful core oriented sustainable solutions! !